Book Description: The Secrets of Facilitation delivers a clear vision of facilitation excellence and reveals the specific techniques effective facilitators use to produce consistent, repeatable results with groups. Author Michael Wilkinson has trained thousands of managers, mediators, analysts, and consultants around the world to apply the power of SMART (Structured Meeting And Relating Techniques) facilitation to achieve amazing results with teams and task forces. He shows how anyone can use these proven group techniques in conflict resolution, consulting, managing, presenting, teaching, planning, selling, and other professional as well as personal situations. To read more about the book or to order from Amazon. by Tom Justice, David Jamieson, David W., Ph.D. Jamieson "
Book Description: What is facilitation? Ironically, it's a difficult word that means "to make easy." When applied to businesses and organizations, facilitation means helping people work together in groups and teams to achieve their goals. Best of all, The Facilitator's Fieldbook contains a wealth of resources such as checklists, samples, templates, guidelines, and step-by-step procedures. It will enable you to perform all the skills of facilitation, including: * establishing ground rules for groups * planing meetings and agendas * building the group database * brainstorming * decision making * conflict resolution, and more. Midwest Book Review: In The Skilled Facilitator: Practical Wisdom For Developing Effective Groups, Roger Schwarz draws on his own extensive facilitation experience and insight to bring together theory and practice, creating a comprehensive reference for consultants, peer facilitators, mangers, leaders -- anyone whose role is to guide groups toward realization their creative and problem-solving potential. The Skilled Facilitator provides essential materials including simple but effective ground rules for governing group interaction; what to say to a group (and when to say it) to keep it on track and moving toward its goal, proven techniques for starting meetings on the right (and ending them positively and decisively), practical methods for handling emotions (particularly negative emotions) when they arise in a group context, and a diagnostic approach for helping both facilitators and group members identify and solve problems that can undermine the group process. The Skilled Facilitator provides a clearly defined set of basic principles to help facilitators develop sound, value-based responses to a wide range of unpredictable situations. It also includes advice on how to work with outside consultants and facilitate within one's own organizations, along with a groundbreaking section on facilitative leadership. 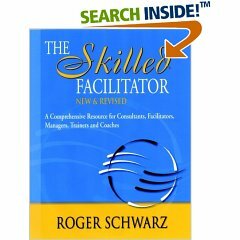 The Skilled Facilitator is an excellent addition to any business or community library shelf. To read more about the book or to order from Amazon. This book is designed to help you make a REAL difference. Effective facilitation is much more than meeting agendas and flipcharts. Helping individuals, groups and organizations get "unstuck" requires both fundamental skills and a systematic process. MF takes the mystery out of facilitation and provides an approach that gives you a real chance to achieve dramatic results. (You also get to see what happens when it doesn't turn out exactly as I had planned it!) Hope it helps you become a catalyst for lasting change!! Not Yet Available: You may still order this title. We will ship it to you when it is released by the publisher. Facilitating With Ease is a clear and comprehensive text book on facilitation that includes dozens of tools and techniques that can be copied and used in running your next meeting. Find out why this book sells out at every conference bookstore it is offered at!